Why, yes, I am on a cupcake binge. Thanks for noticing. 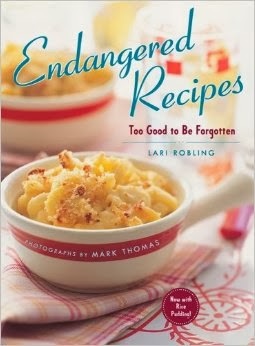 This time, the cupcakes are an adaptation from the book Endangered Recipes by Lari Robling. Her recipe was for a gingerbread cake, but I figured it would be fine for cupcakes. I mean, why not? I made a few adjustments for altitude, but I'm giving the book's measurements here. To adjust for altitude, I measured the sugar and leavening a little light and added just a touch more water. Easy peasy. the cupcakes came out perfectly. All dressed up for Halloween - with a cream cheese frosting. Preheat the oven to 350 degrees and put cupcake papers into the cups of two 12-cup cupcake pans. In a medium bowl, combine the flour, cinnamon, ginger, baking powder, baking soda, cloves, and salt. Whisk to combine. Put the butter pieces in another bowl and pour the boiling water over the butter. Stir. The butter should melt, or at least soften. Add the sugar, molasses and eggs. Beat well. Add the dry ingredients all at once and mix well. Portion the batter into the cupcake pans - filling them a tad more than 1/2 full, I got about 20 cupcakes If you fill them a little more full, you'll have fewer cupcakes. Bake at 350 degrees until the cupcakes spring back when touched lightly in the center and a toothpick inserted in the center of one comes out clean - about 25 minutes. Let the cupcakes cool in the pan until you can remove them without burning your fingers. Let them cool completely on a rack before frosting. I thought this brown sugar frosting worked particularly well with the cupcakes. *I don't think I've ever noticed light molasses at the store, but I happened to have a bottle of molasses labeled "Golden Molasses." It seemed to me to be about the same as regular molasses, but maybe there's a difference. Two "almosts" and a "maybe"